Have you ever found yourself waiting beside an airport luggage carousel with that sinking feeling? Your fellow passengers are long gone, having already wheeled their bags and trolleys out into the arrivals hall and the world beyond. Image by Gloom on Flickr. Yet here you are. Bagless. And the carousel just keeps going around and around. It's a genuine fear for many travellers, and it can start from the moment your bags jiggle away at check-in after being weighed and tagged and sent on their merry way. 'Will I ever see you again? ', you think before wandering mindlessly into the distractions of the duty free wonderland through which you inevitably must pass before taking your assigned seat for take-off. Millions of bags travel every day, whizzing and transiting with their little white tags through airports right around the world. Those tags with their 3-letter codes and barcodes almost always determine their route and destination with incredible accuracy. And yet, occasionally, things do go awry. So what should you do if you find yourself at the carousel with no bag, drowning in that sinking feeling? We asked some ATAS-accredited travel agents for their tips and experiences. For Matt Inman from Maxim's Travel in Sydney, your first step should be to retrieve your boarding pass with that baggage receipt affixed to it. That little sticker could be your saviour. "The most important thing to keep is your baggage receipt", says Matt. "It’s given to you by the check-in staff when you check your bags. It’s easy perhaps to not give it a second thought, but that barcode is unique to your luggage, and is the quickest and easiest way for the airline to locate it. It might not be where you'd like it to be, but getting a fix on its location is the first step", he adds. With that receipt firmly in hand, find the nearest airport representative or take it to the baggage services counter in the terminal. Typically, they'll be close to the carousel and, with luck, a simple scan will tell them precisely the location of your bag. But even with all the tracking technology and infrastructure, there's no guarantee of a swift and happy resolution. If you're in Miami and your bags are in Munich, there's going to be a delay before you're reunited with them. Tina Killeen, General Manager of Spencer Travel, says travellers in this predicament should immediately lodge a claim at the baggage services counter. The same applies to damaged luggage. "Whether your luggage is lost or damaged, having a claim number will make every step of the process easier. Depending on the length of time your bags are expected to be missing, it is also best to check with your travel insurance if you are covered for any replacements", advises Tina. "The sooner an insurance claim is lodged, the sooner you'll know what your travel insurance policy entitles you to. Getting that claim process underway quickly is important, too", adds Tina. Tina also points out that travellers that book with ATAS-accredited travel agents like Spencer Travel benefit from the close connections between agent and airline. "Thankfully, due to the relationships we have with our suppliers, we can work with them to help our clients. Knowing that we're in their corner and working away behind the scenes is a great source of comfort to them", says Tina. It goes without saying that travellers should always have a travel insurance policy that’s suitable to their needs. Policies can vary greatly in terms of how and what they cover, so it's essential that travellers understand how their policy works in relation to lost and damaged luggage. "The insurance provider will likely only be required to be contacted if your bags are lost and it will take longer than a day to be reunited with them. Depending on the insurance policy, there may be provisions to claim for emergency clothes and essential items that you will have to purchase", says Matt Inman. Trevor Jones, Managing Director of Hawthorn Travel & Cruise in Melbourne, has a novel recommendation. "Always take a photograph of your luggage when you check it in. Having that photo on your phone will be a great help, whether your bags are damaged or missing, when you're standing at the service desk filling out paperwork", says Trevor. For Trevor, it's quite a simple rule: Imagine you own the travel insurance company, and consider what evidence you would want before paying out a claim. Like Tina, Trevor also points out the benefits of booking with an ATAS-accredited travel agent. "Most times it sorts itself out within 24 hours, but we’ve had instances where replacement clothes and accessories were required. We've been able to leverage our local ground operator connections to provide assistance to our clients", he says. Tina points out that there are also a number of readily available services, apps and tracking technologies available to travellers these days. "Always ask your travel advisor for recommendations", says Tina. One thing that Matt, Tina and Trevor all agree on, is the importance of keeping valuables and essentials with you in your carry-on. "Always travel with jewellery, medication and any important documents that you can’t afford to lose. You should always have them on you. I also travel with a change of clothes and enough essentials to get me through the first 24 hours after arrival just in case", says Tina. Your ATAS travel agent can help ensure you are 100% ready to travel, but here are a few travel warnings and useful tips to keep in mind. Looking for more insights from ATAS-accredited travel agents? Here’s you need to know about travelling for Anzac Day, exploring Greece in new ways, and the student travel market—it’s much more than bargain basement, budget breaks and backpacking. 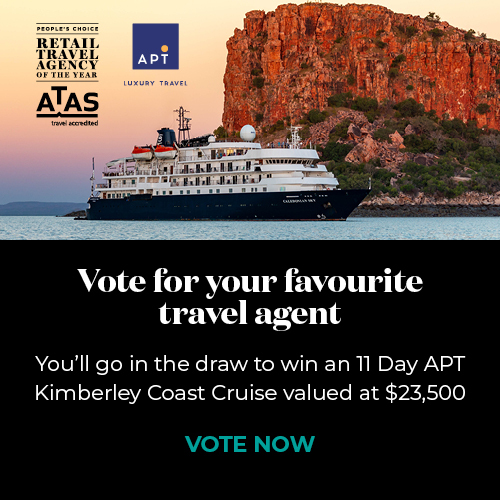 WHO WILL BE CROWNED THE 2019 PEOPLE'S CHOICE TRAVEL AGENCY OF THE YEAR?